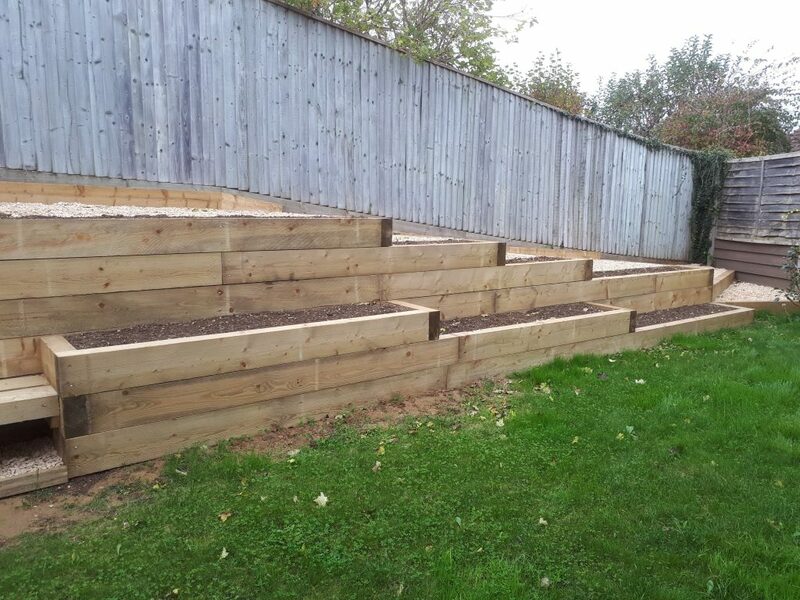 The brief from my clients was very clear – to create a mobility friendly garden which flowed from one section to another. 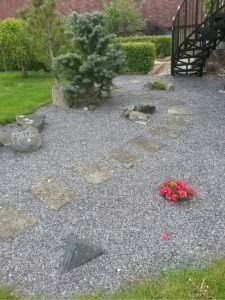 The clients were keen to get rid of their existing lawn which suffered from bad drainage and surface water pooling and to use stone and gravel to create an oasis of tranquility where they could easily get around, relax and entertain. 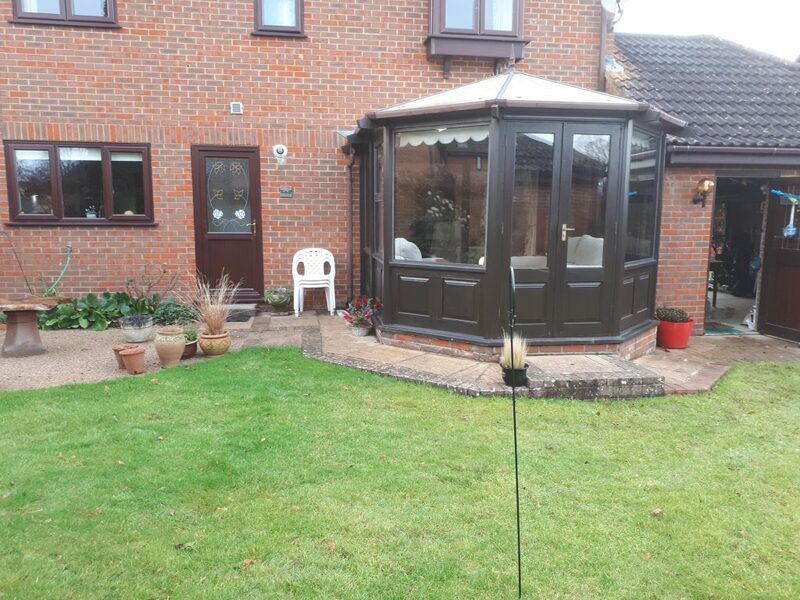 Access from the conservatory was a key consideration and had to be completely redesigned for scooter access and mobility. 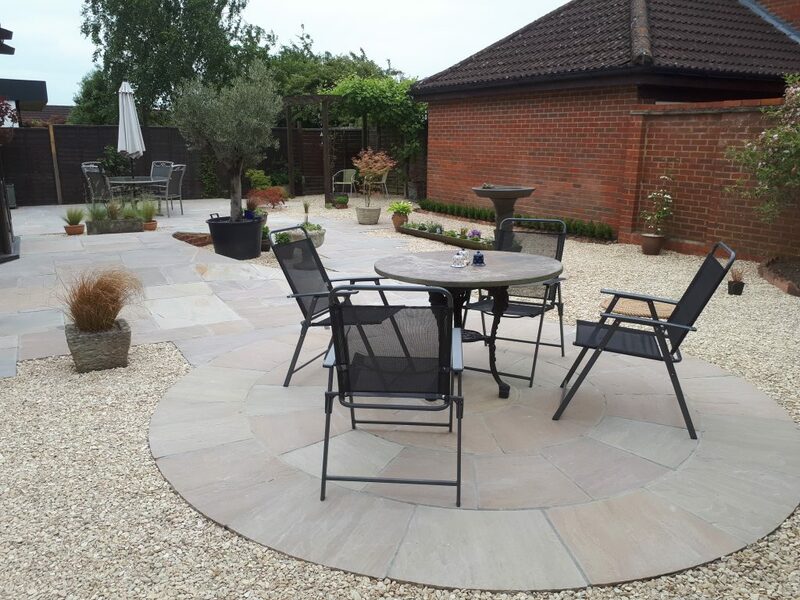 The solution was a curved path flowing out from the door on both the left and right hand sides to provide seamless access to a new patio and a second seating area. 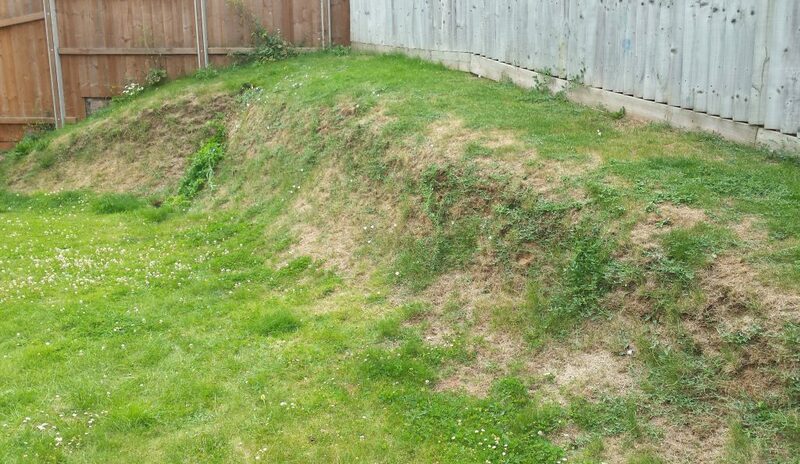 A french drain was also included to solve the bad water drainage problem. 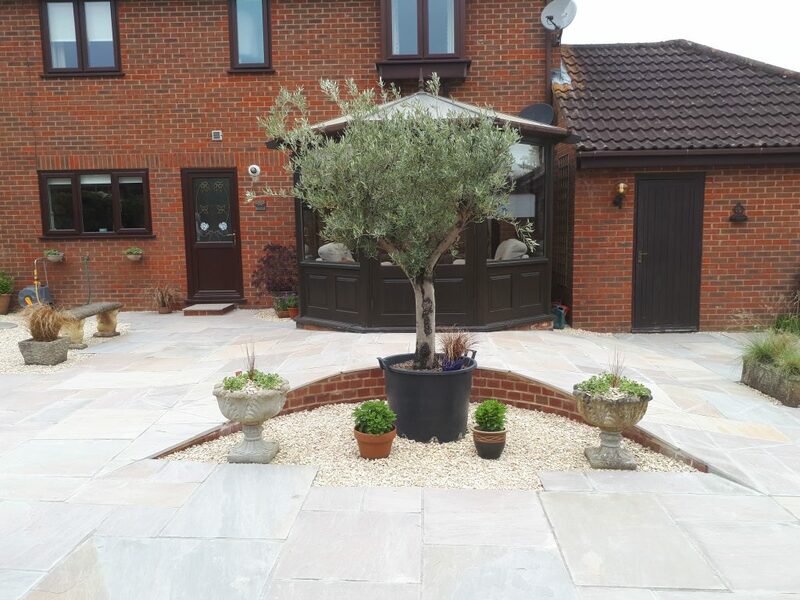 The hard landscaping was all done by Mike Kynock of Landscaping & Property Care and his team using Raj Blend Sandstone and Cotswold round gravel. The two front borders had poor soil with lots of stone and faced south so were in the sun for most of the time with a tendency to dry out and the area was also quite exposed to the winds. The answer was Mediterranean planting! 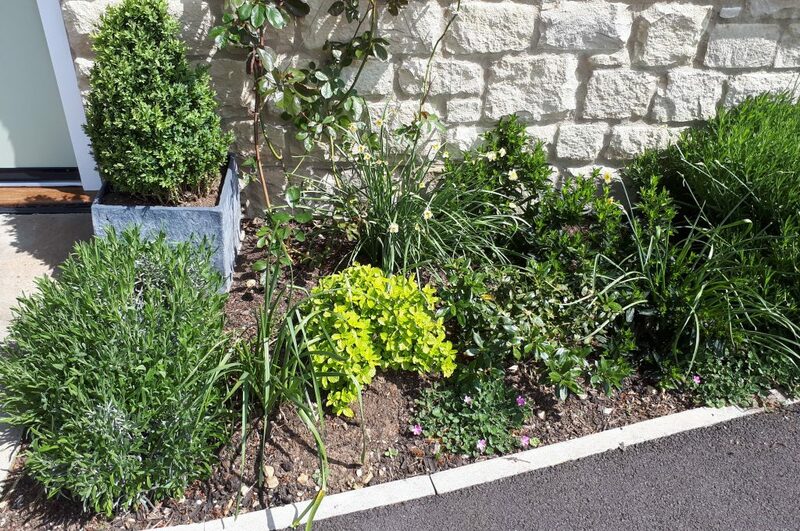 I kept the existing rock roses and some of the existing lavender which was doing so well that it was overwhelming the area and replaced it with a mixture of sun loving hardy perennials. Origanum ‘Rosenkuppel’ – great for bees and lovely pink/purple flowers through the summer, Sedum ‘Purple Emperor’ – beautiful purple fleshy leaves with dark red flowers which are again a bee magnet, Lychnis coronaria (Rose Campion) – elegant tall grey leaves topped with brilliant pink flowers, Gaura lindheimeri – wafting stems topped with white/pink flowers and finally Erigeron karvanskianos – pretty tiny daisies cascading over the edge of the border from June through to Autumn. 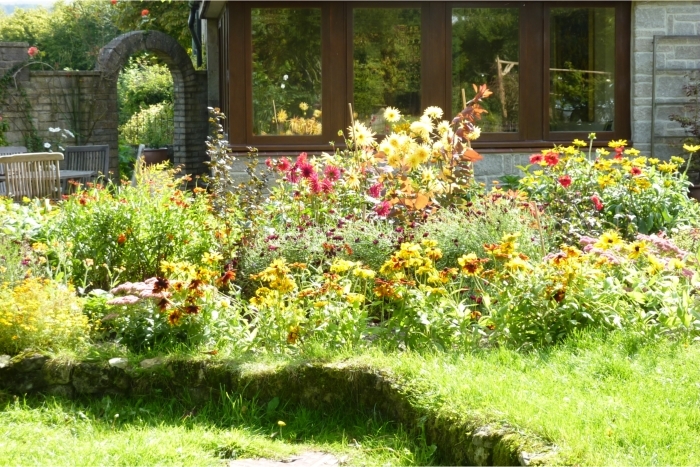 The brief from my client was to bring some structure and cohesion to this medium-sized country garden and to turn it into a pretty cottage garden. 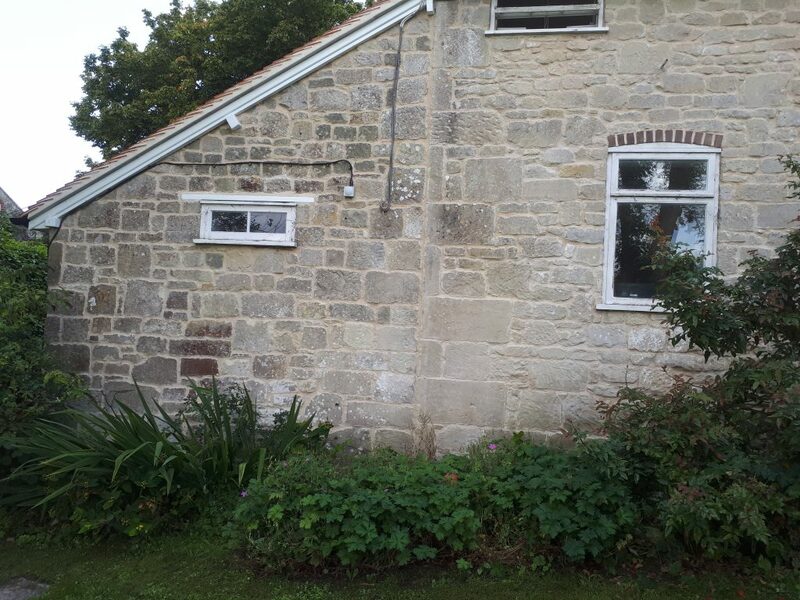 The two narrow borders on either side of the back door were filled with large shrubs which had outgrown their space and blocking the light from the windows and massive geraniums which were encroaching on the lawn so the first stage was to remove everything from these borders and then dig in manure as the soil is quite heavy with a clay base. 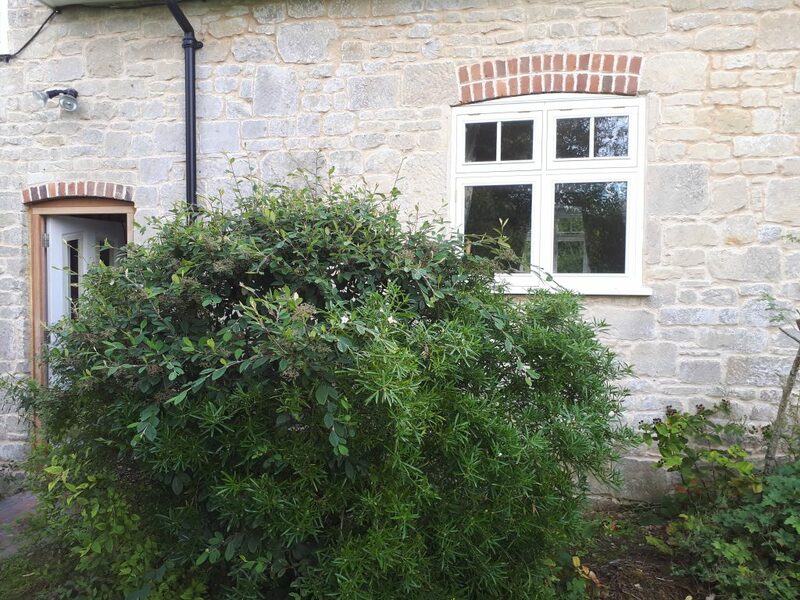 Shrubs and perennials were chosen to suit the site which is also north facing so Choisya Ternata ‘White Dazzler’ was planted either side of the door to provide summer interest with scented white flowers. A combination of Weigela florida ‘Folis Purpurea’, Hebe ‘Mrs Winder’, Euonymous fortuneii ‘Emerald Gaiety’ and Viburnum davidii provide the structure, gorgeous long flowering purple/blue Geranium ‘Rozanne’ weaves through the middle and Alchemilla Mollis, Heuchera ‘Marvelous Marble’ and pale pink Geranium sanguineum ‘Max frei’ all create a frothy edging. 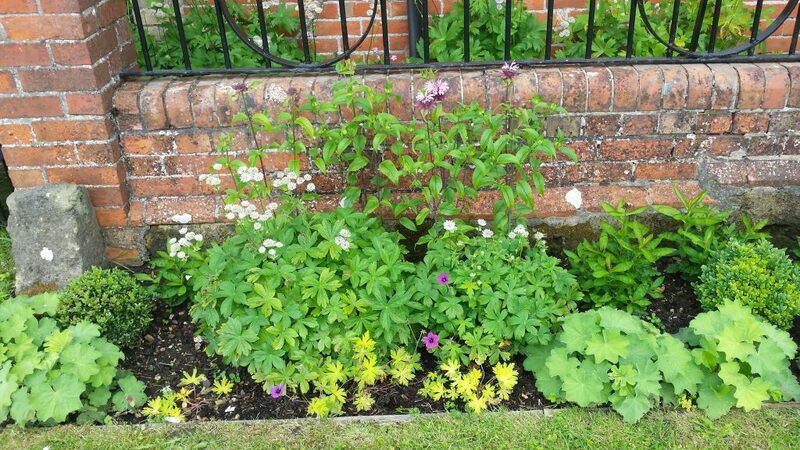 Finally height at the back is provided by white flowered Anemone hybrida ‘Whirlwind’ and purple Aster ‘Little Carlow’ both of which will flower from mid-summer through to the first frosts of Autumn. 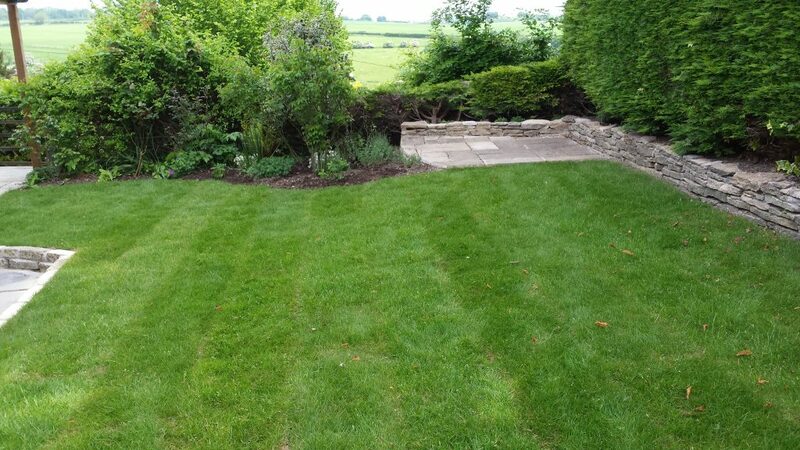 The second stage of the garden redesign was to enlarge and redesign a border at the top of the lawn and link the planting to the borders by the house. 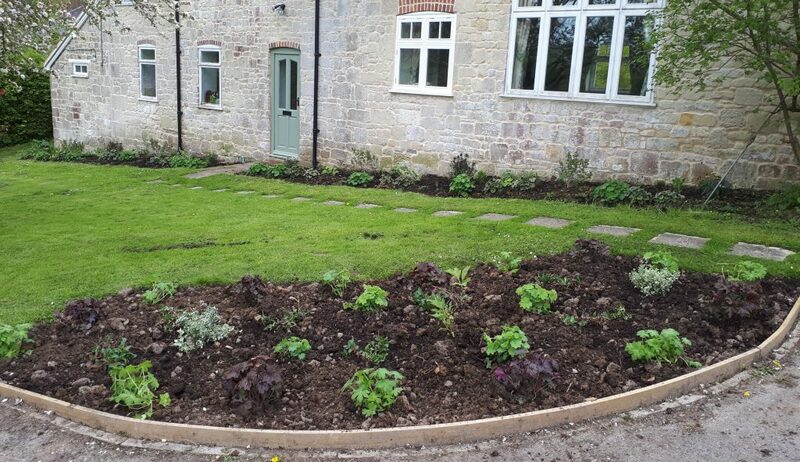 After the border had been dug out, edged and manured it was replanted with Hydrangea quercifolia as the centre piece surrounded by evergreen Euonymous fortuneii ‘Emerald Gaiety’ and Persicaria affinis superba which is superb ground cover with very pretty pink/red flowers. Alchemilla mollis, Heuchera ‘Palace Purple’ and the pretty white Geranium macrorrhizum ‘Spessart’ provide the soft edging. 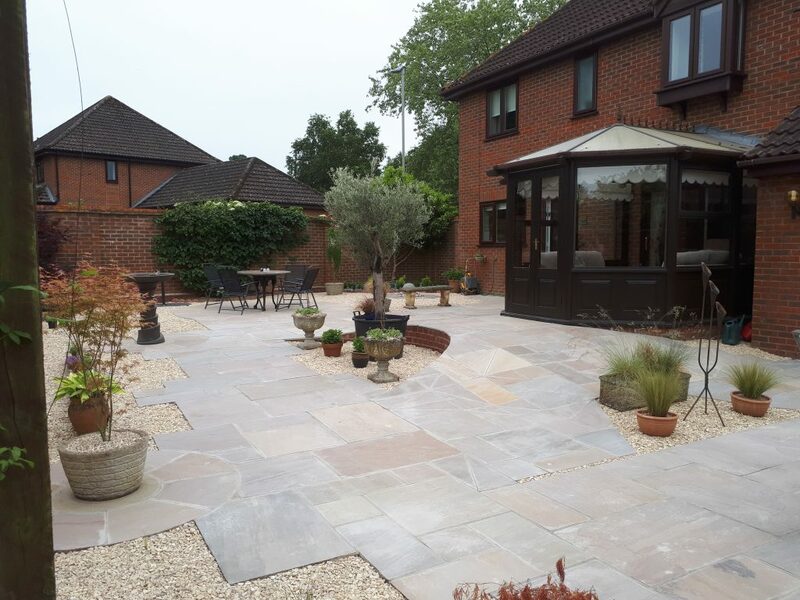 The clients wanted a complete redesign of their garden to create a space for relaxing and entertaining with their family and friends. 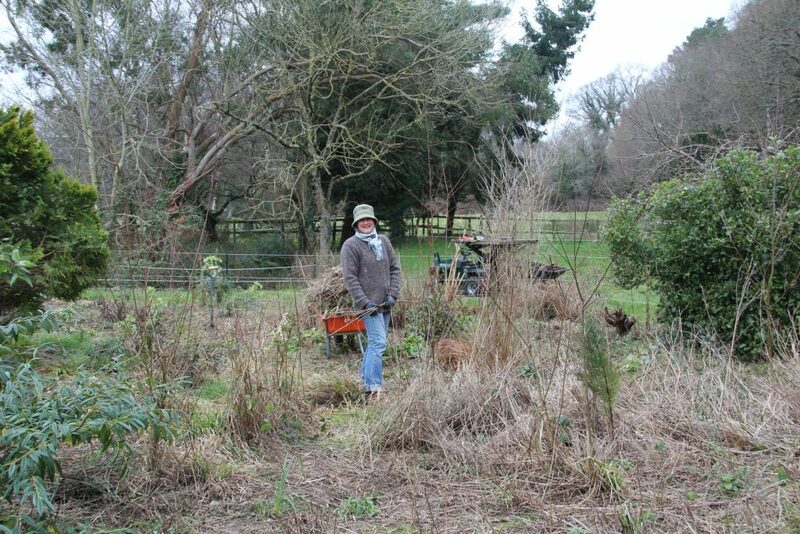 The garden was long and narrow so I decided to split up the space into three different sections. 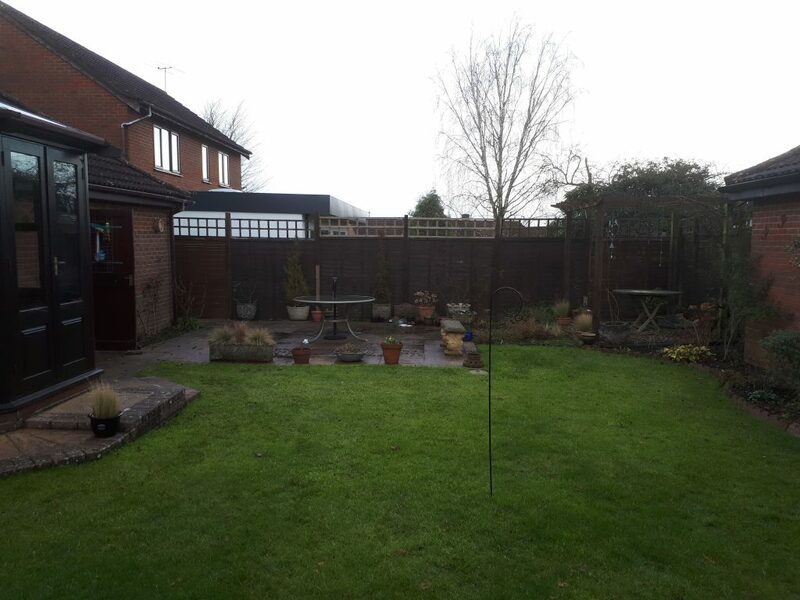 The top section nearest the house included an oval patio surrounded with new planting, a trellis and rose arch to create some privacy and a new border with sweet smelling and colourful shrubs and flowers for interest all through the year. 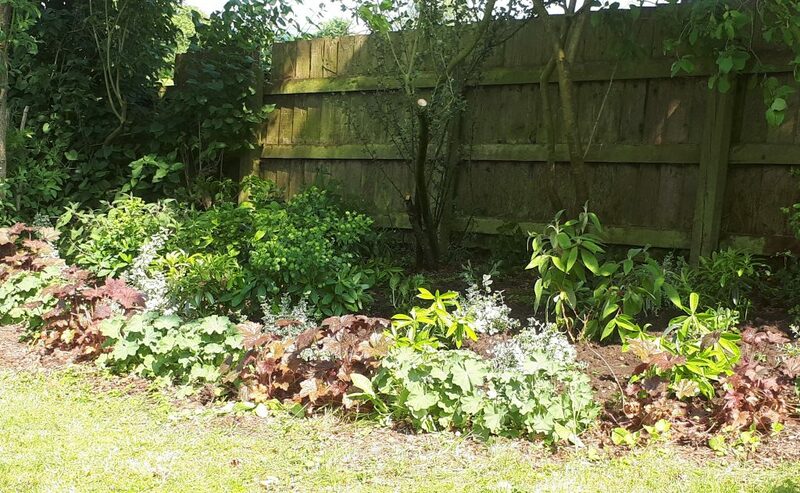 The middle section of the garden already had two existing borders so these were reshaped and planted with large evergreen shrubs and perennials for a more natural and woodland feel. 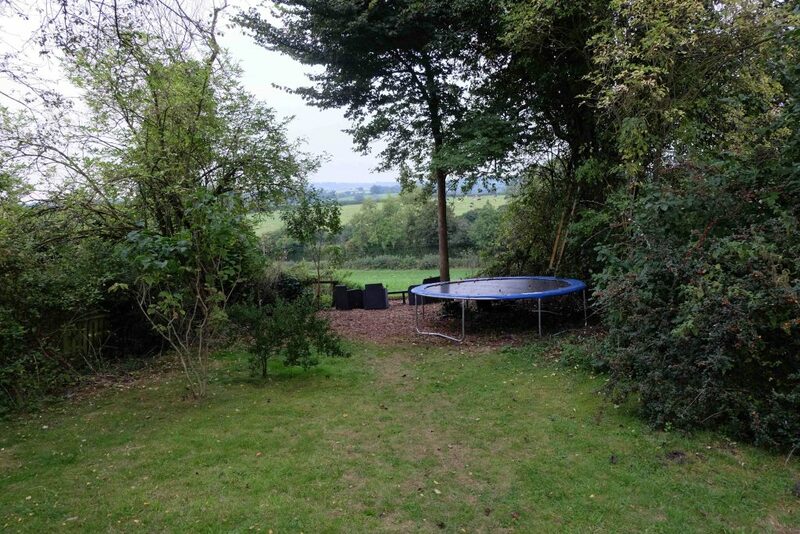 The children’s trampoline will also move across to the right hand side of the garden so that it doesn’t block the view through the rose arch from the top of the garden. 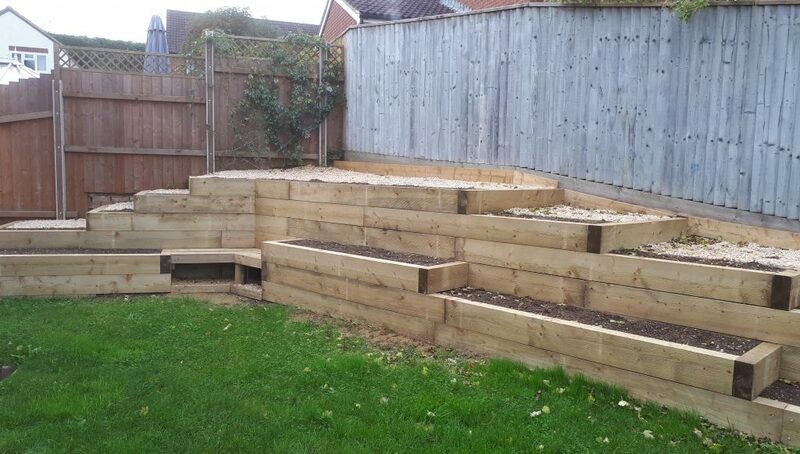 The bottom end of the garden will have a sunken semi circle seating area with a low evergreen hedge looking out across the countryside and a new compost bin built in the lower right hand corner with trellis for concealing climbers. Finally a sunken stone pave path will curve down through all the sections linking them all together and providing access to the shed and bottom of the garden. At the top end of the garden the patio has been laid and the planting completed except for a new herb border next to the back door. The planting has focused on creating colour and scent using perennials including Lavandula augustifolia ‘Imperial Gem’, Geranium sanguineum and Rozanne, Penstemon ‘Apple Blossom’ and ‘Garnet’, Phlox paniculata ‘Amethyst’ and Aster ‘Little Carlow’ all anchored with evergreen shrubs such as Choisya Ternata, Hebe ‘Wiri Charm’ and Pittosporum tenuifolium ‘Irene Paterson’ . Climbing through the trellis and over the arch will be pale pink climbing rose – ‘Mortimer Sackler, vigorous evergreen honeysuckle – Lonicera japonica ‘repens’ – and a pretty spring flowering clematis – Clematis alpina ‘Pink Flamingo’. 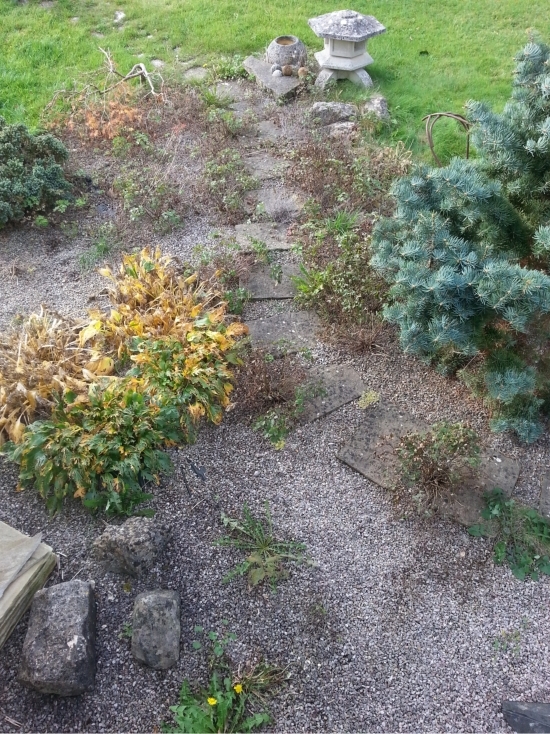 The two woodland borders in the middle have been ‘mirror planted’ with shrubs including Hydrangea villosa and Hydrangea ‘Lanarth White’, Euonymous fortuneii ‘Emerald Gaiety, Euphorbia robbiae, Skimmia ‘Kew Green’ and Viburnum tinus ‘Lisarose’, all of which can handle both sun and some shade. 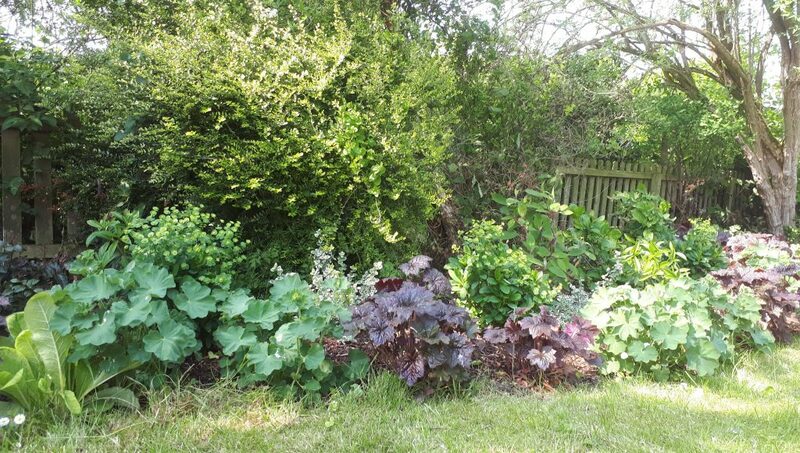 Both borders are edged with a combination of Heuchera ‘Palace Purple and Alchemilla mollis. 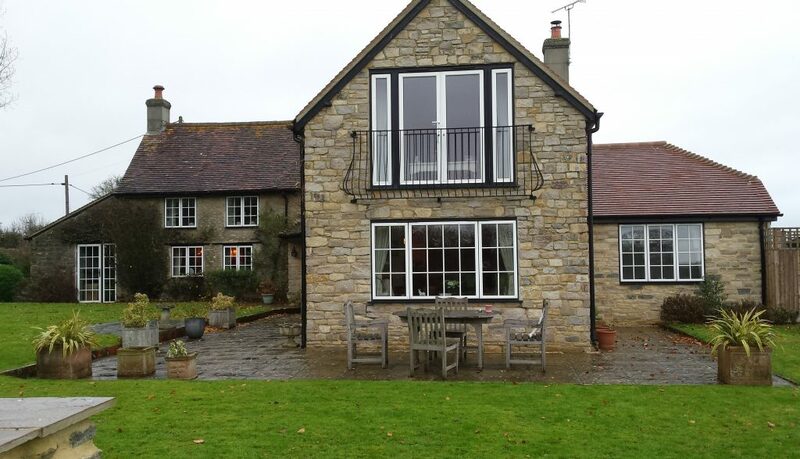 The original house had been extended and the car park area changed so the whole entrance into the garden and access to the house had to be rethought. 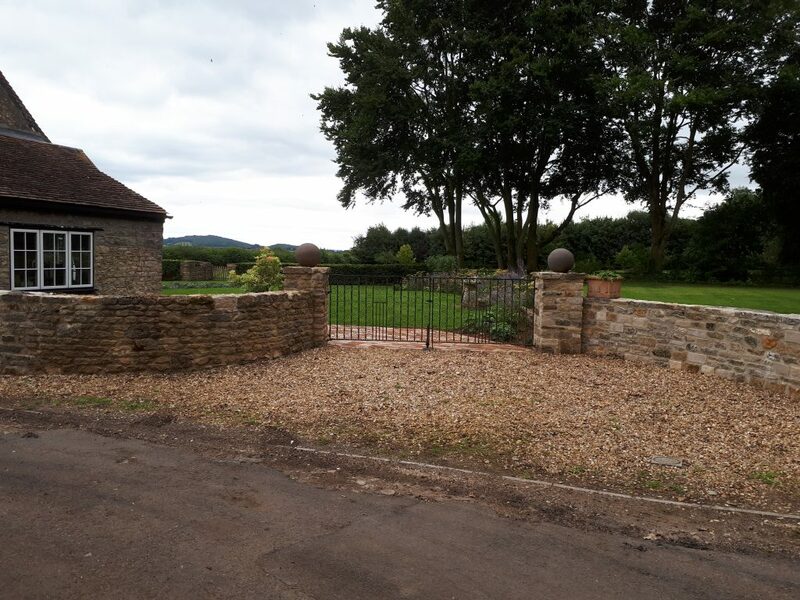 The solution was to move the double entrance gates to meet the path which had been moved and lengthened to create flow from the entrance to the house. 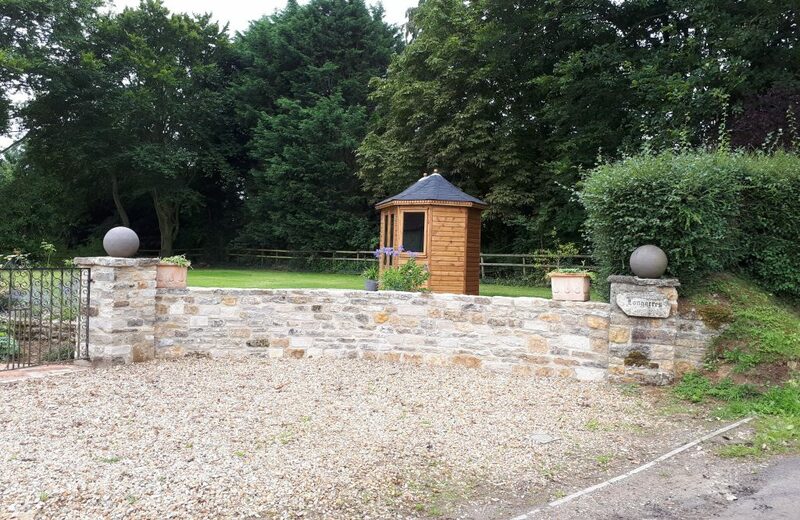 The car park area was turfed over with space kept for a new pergola. Finally a lilac tree – Syringa ‘Katherine Havemeyer’ was planted garden side in the middle of the new curved wall to provide an element of privacy. 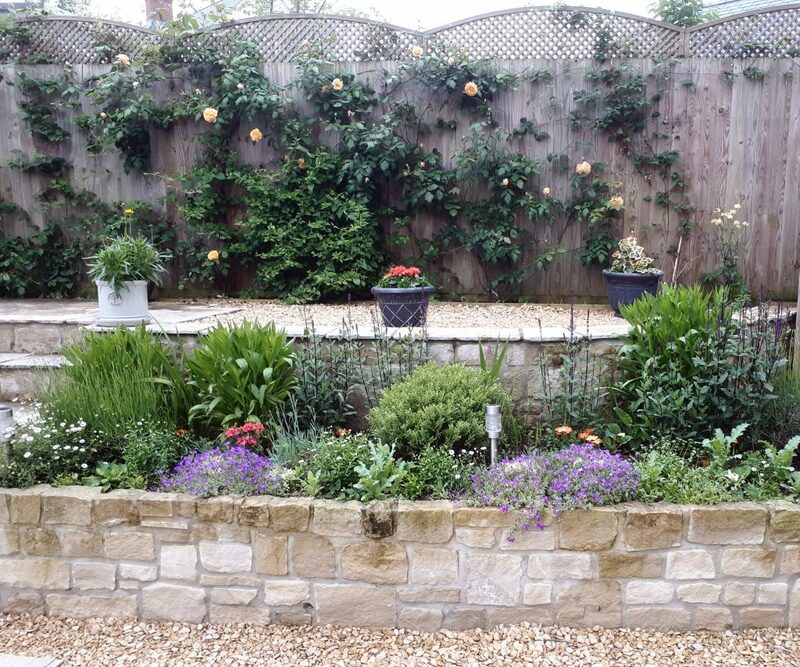 A huge photinia hedge was taken out and two existing oval borders removed from the middle of the lawn and then new borders were created above and below the existing stone wall with planting kept to a palette of purple, white and orange. 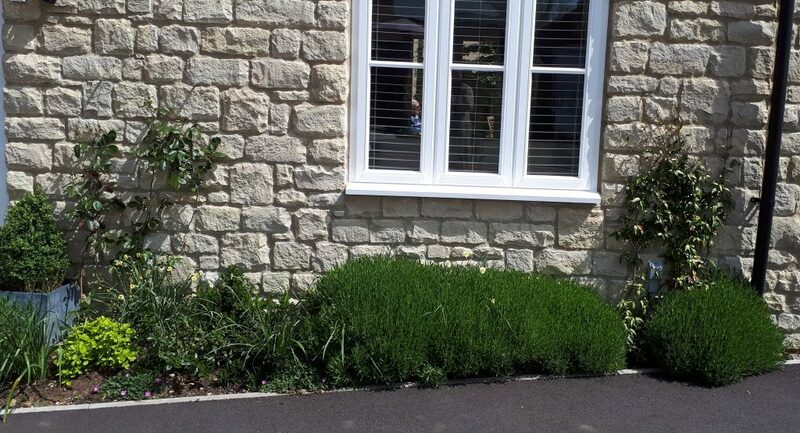 Plants included Lavandula x intermedia ‘Grappenhall’, Achillea ‘Terracotta’, Geranium ‘Rozanne’ and Perovskia ‘Small Spires’ with Erigeron karvanskianos used to tumble over the stone edge of the wall. Hebe rakaensis and Euonymous ‘Silver Queen’ were used for structure together with existing roses. 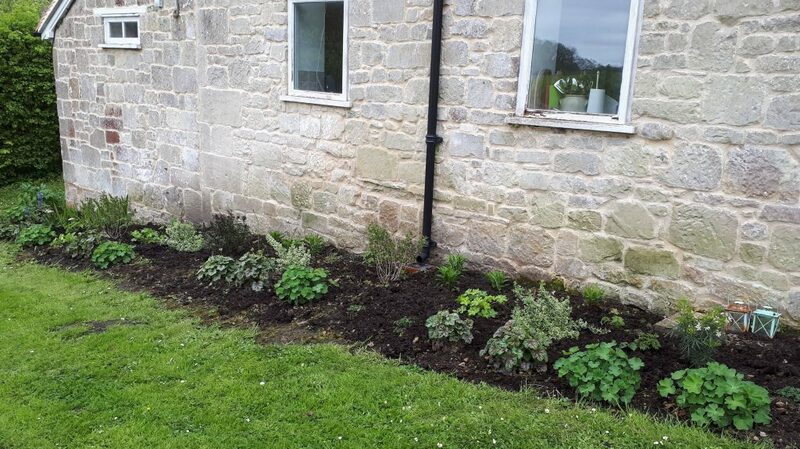 A small border was also introduced around the existing patio and planted with mainly silver and purple plants including Cistus x purpureus, Convolvulus cneorum, Lavandula augustifolia ‘Hidcote’ with dark pink and purple aubretia for edging. 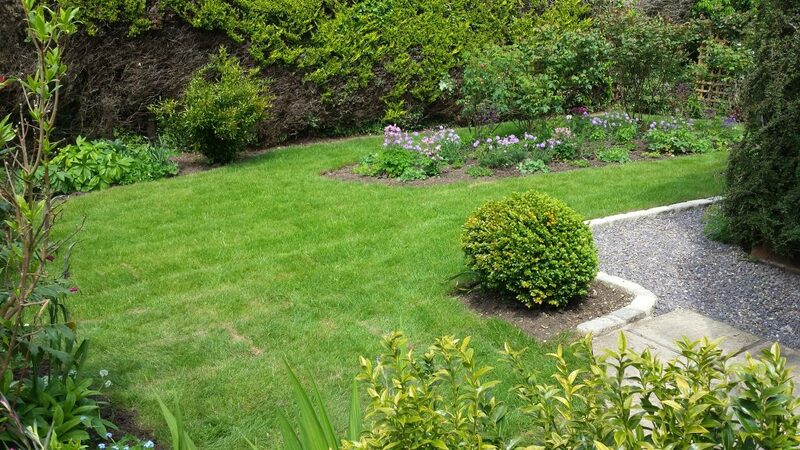 The brief from my client was to create a modern cottage style garden to compliment the new house and hard landscaping which were built in a traditional style using local stone. 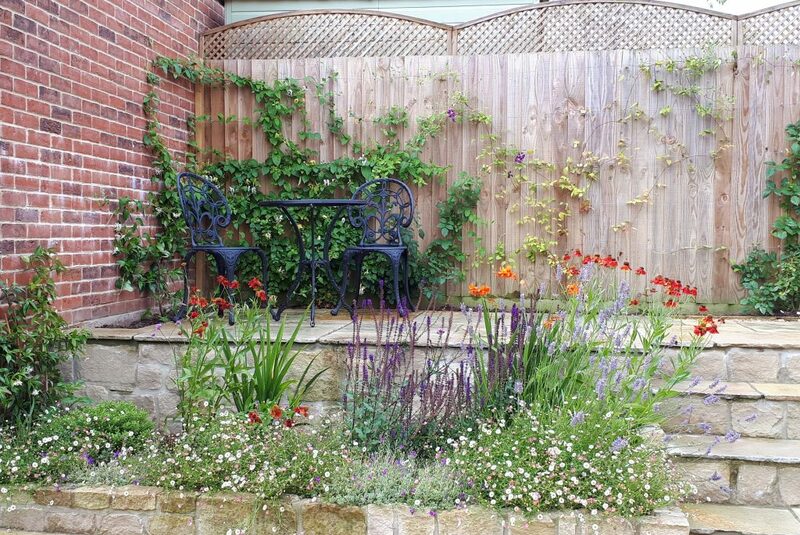 The garden is completely enclosed with a wooden fence and a large expanse of red brick wall so a combination of cream and orange roses, evergreen clematis armandii for spring interest and evergreen honeysuckle under-planted with cream and orange tulips were planted to begin creating walls of colour. 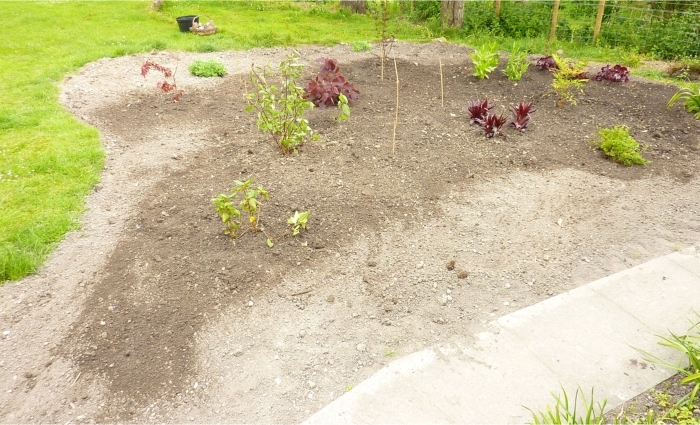 The rest of the planting was enclosed in two large raised beds so I used white Hebe rakaiensis and pale mauve Lavandula intermedia x ‘Grosso’ for structure complimented by orange Helenium ‘Moerheim Beauty’, dark purple Salvia Nemorosa ‘Caradonna’ , Verbena bonariensis ‘Lollipop’ and the lovely Crocosmia mistral with its double orange flower. 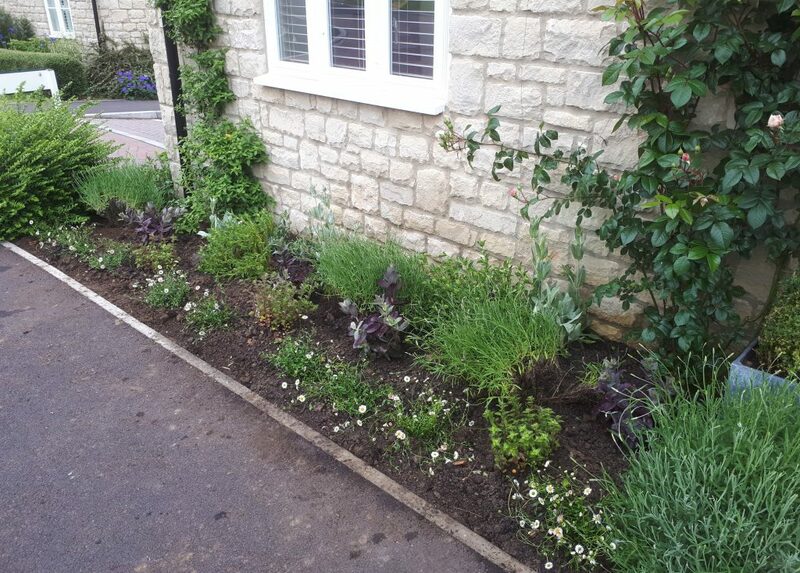 The planters were edged with a combination of Erigeron karvinskianos and purple Aubretia variegata. 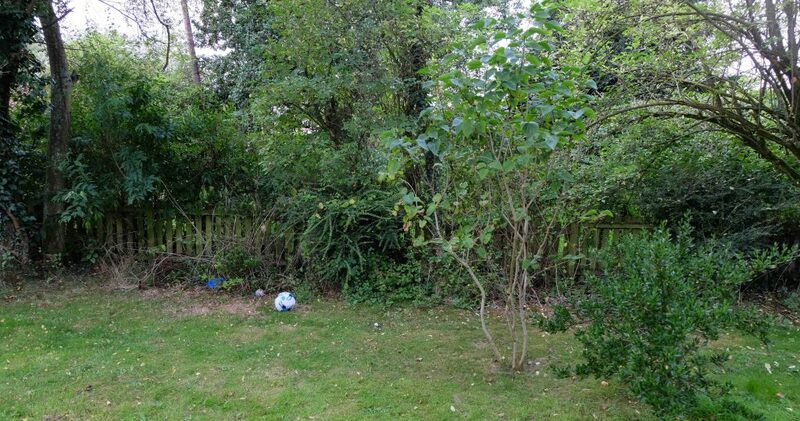 The original space to the front of the house was an overgrown jungle with trees growing right up to the house and any view completely blocked. 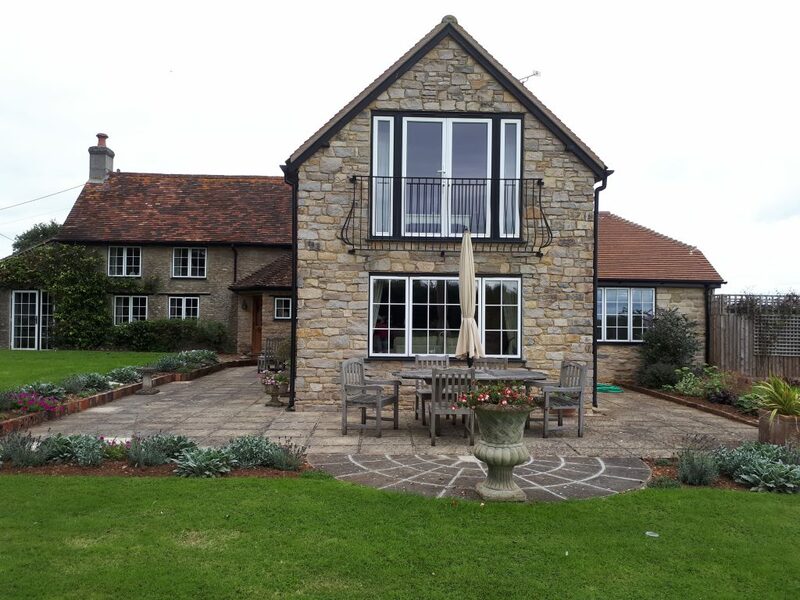 The clients wanted a complete re-design so that they could sit outside in the evening and look through the garden to their fruit orchard beyond. 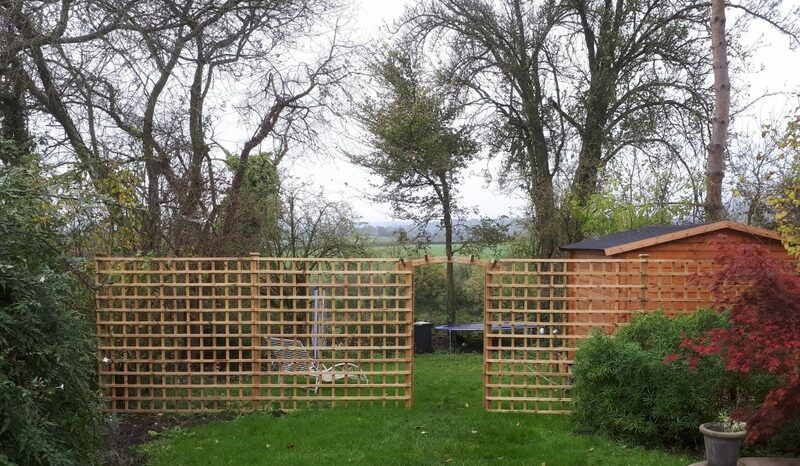 The whole space was completely cleared of all plants and the edge defined by a new picket fence and gate. 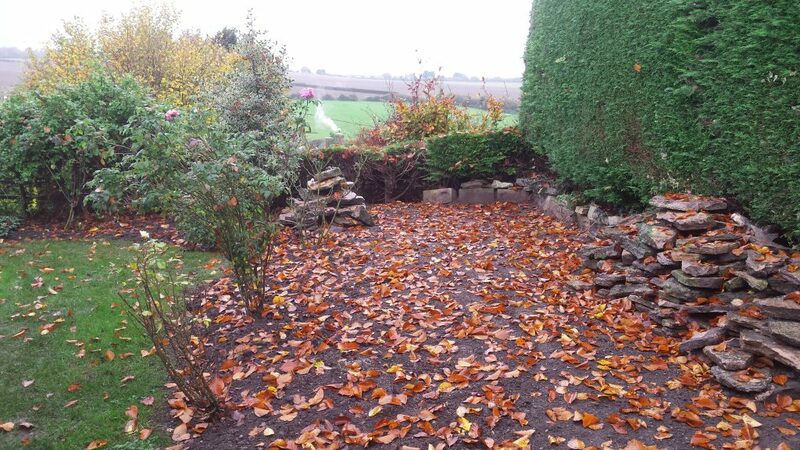 A new sunken stone path was then laid through the centre to provide access from the patio to the orchard. The garden was designed so that the colour palette ranged from hot colours such as red, purple and dark pink through to more soft shades of white, mauve, lilac and pale pink. 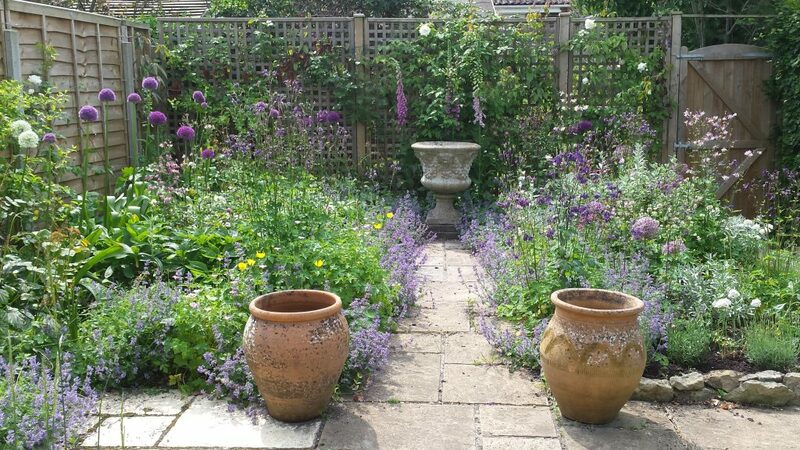 The hard edges of the path were softened by a combination of Geranium x sanguineum and Nepeta and Lavandula ‘Munstead’ lined the edge to the patio to provide scent in the evening. 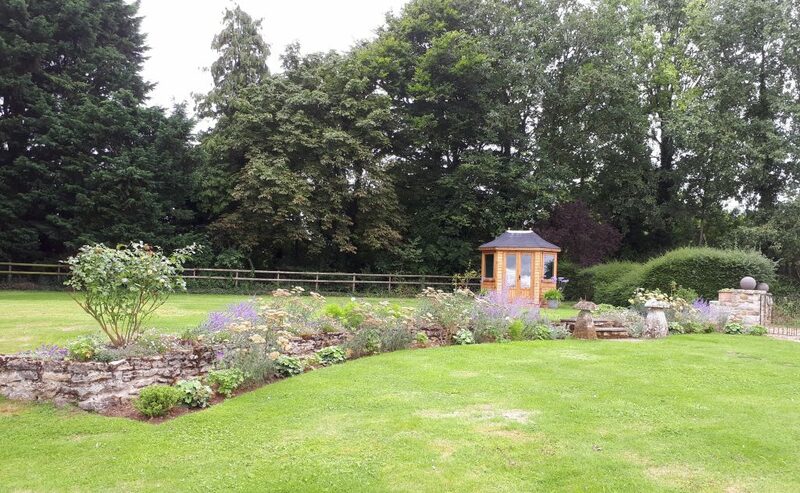 Structure was provided by shrubs such as Philadelphus ‘Virginal’ and Ceanothus x pallidus ‘Marie Simon’ on the soft side and Weigela florida, Cistus purpureus and Buddleja Buzz ‘Blue Sky’ and ‘Magenta’ on the hot side. Red and dark pink ground cover roses, Geranium x magnificum, Astrantia ‘Major’ and Monarda ‘Pink Lace’ provide ground cover whilst blue delphiniums and white and pink foxgloves provide structure along the fence. 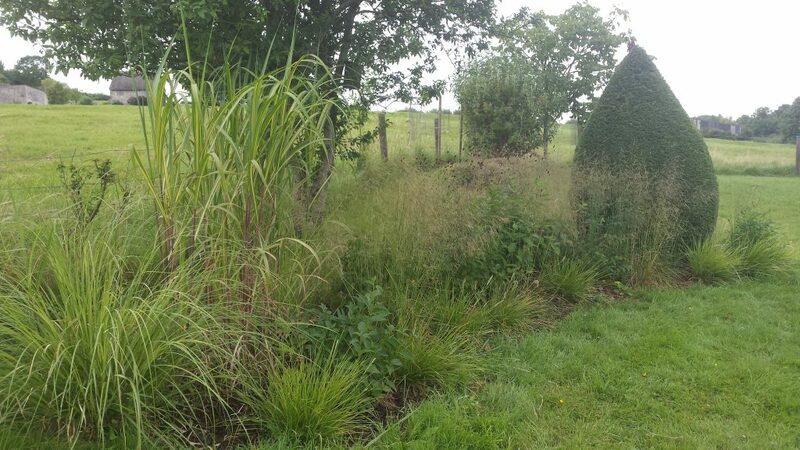 The brief from the client was to re-design the border in the ‘Prairie’ style with grasses and other similar plants whilst keeping the existing dogwoods and the yew cone at the end of the border. 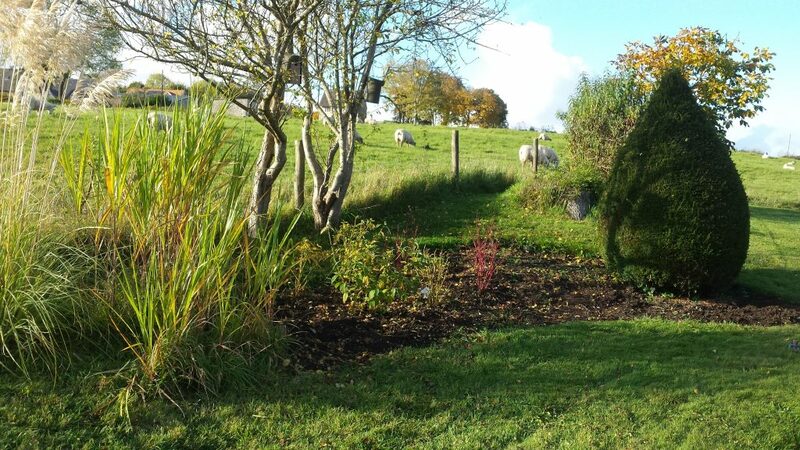 I chose three different grasses to plant in drifts throughout the border accompanied by Sanguisorba officianalis which has small dark red button like flowers above elegant leaves. Sesleria autumnalis (moor grass) is a bright green evergreen grass with silver grey flower spikes in the summer and was perfect for helping to define the edge of the border. Deschampsia cespitosa ‘Goldtau’ is also evergreen with silvery, reddish-brown flower spikes appearing from early to late summer above dense mounds of slender, arching, mid-green leaves. The feathery flowers mature to a soft golden yellow and shimmer like a golden cloud as it catches the light and looked wonderful planted in front of the dogwoods. Finally Molinia caerulea ‘Moorhexe’ was planted in drifts through the centre of the border. With narrow, grey-green leaves that turn russet-red in autumn, this grass has a profusion of soft purple flowers which contrasted beautifully with the dark burgundy red of the Sanguisorba. 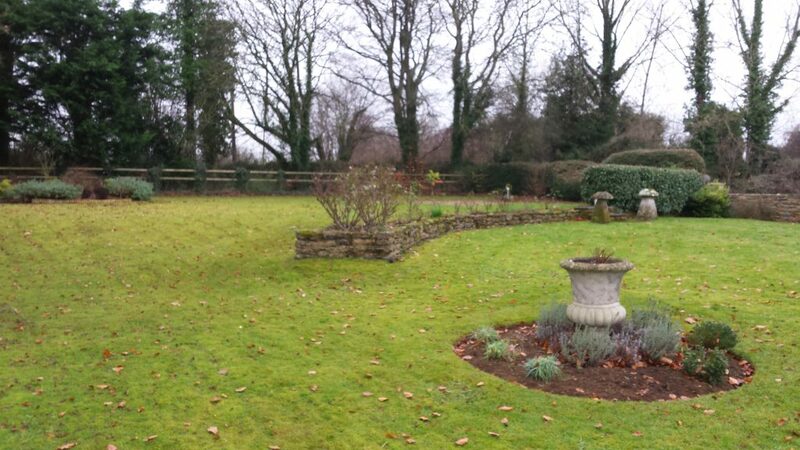 The brief from my client was to design the planting so it complimented the 1930’s style house. 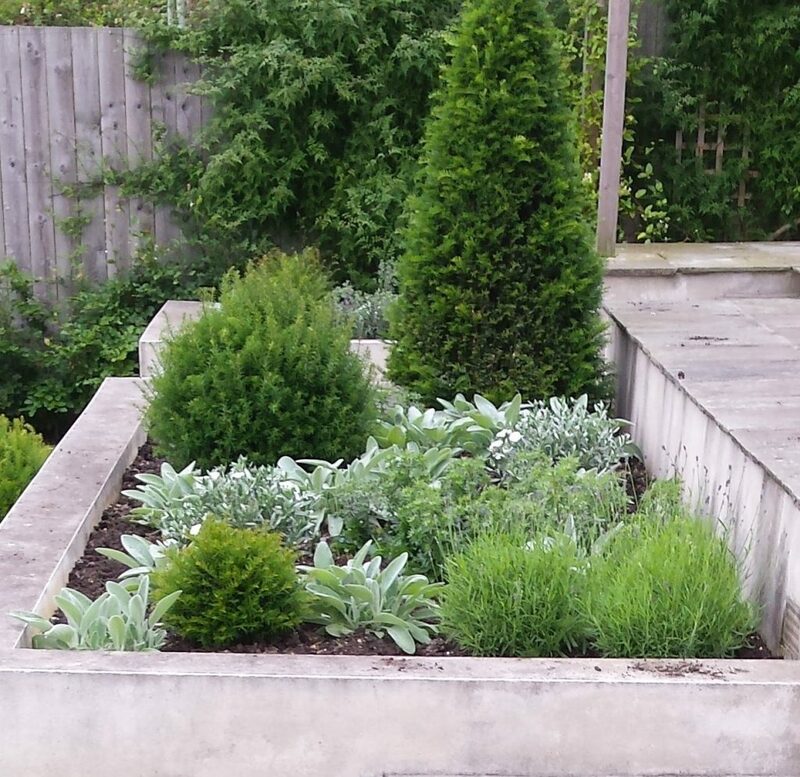 This meant a minimalist design using just four different types of plants and a restricted colour palette of grey, silver, soft purples and dark green. 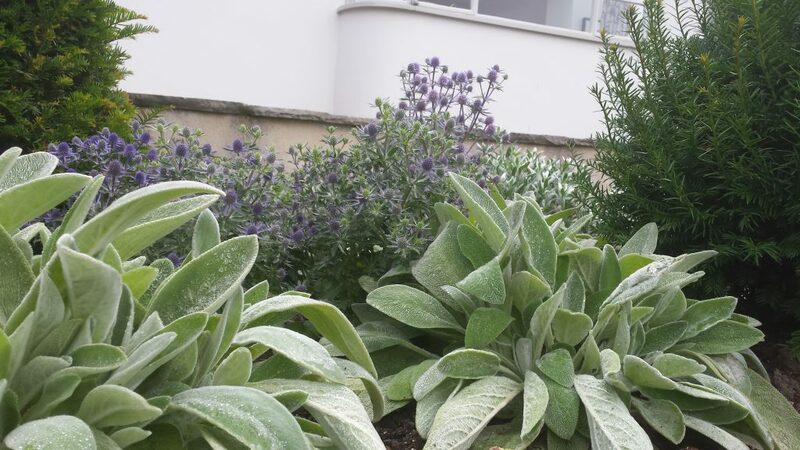 I chose Lavandula augustifolia ‘Munstead’ to be shaped into soft balls and to provide scent, Convovulus cneorum for its lovely evergreen silver foliage and late summer white flowers, Eryngium ‘Blue Hobbit’ for structure and bee loving silvery-blue flowers and finally Stachy byzantina ‘Silver Carpet’ for ground cover. 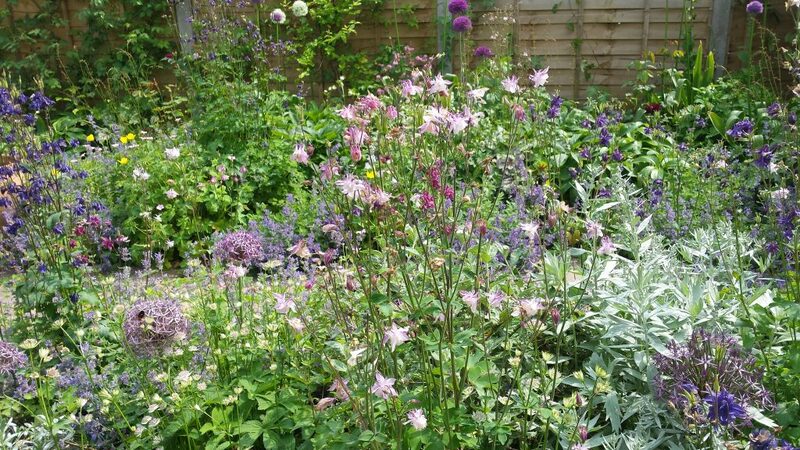 The two narrow borders in front of the property had become completely swamped with astrantias and geraniums; there was no structure and no year round interest. 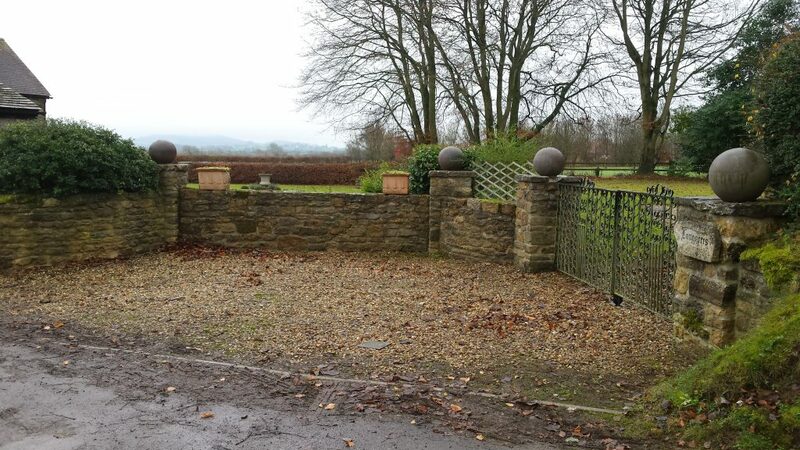 The borders were completely cleared apart from two pretty white roses at either side of the main gate. 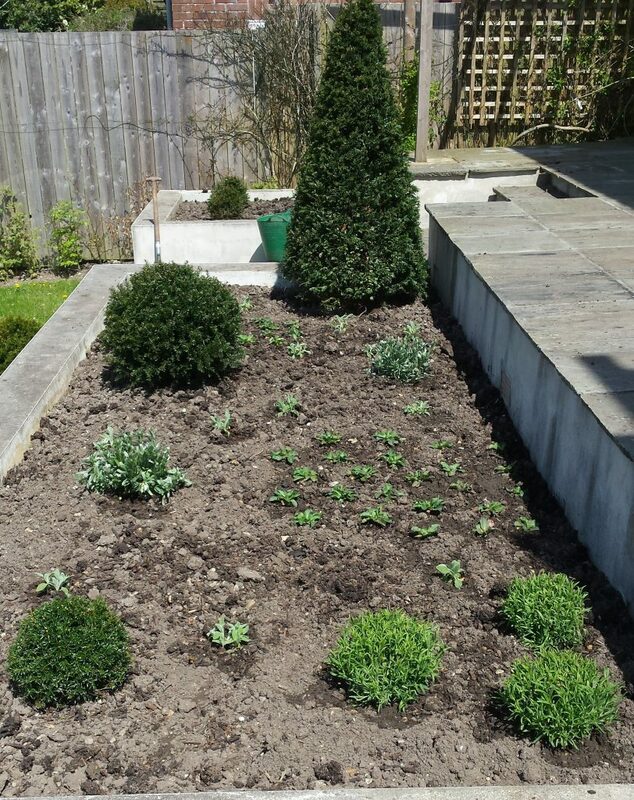 The new planting included box balls to add structure mixed with white astrantias and pale pink monarda at the back of the border for interest throughout the summer followed by dark pink phlox for late summer colour. 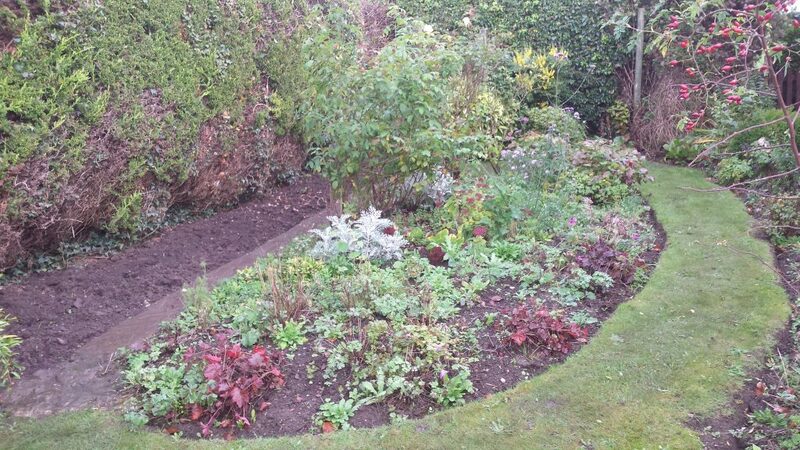 The borders were edged with alchemilla mollis and purple evergreen geranium. 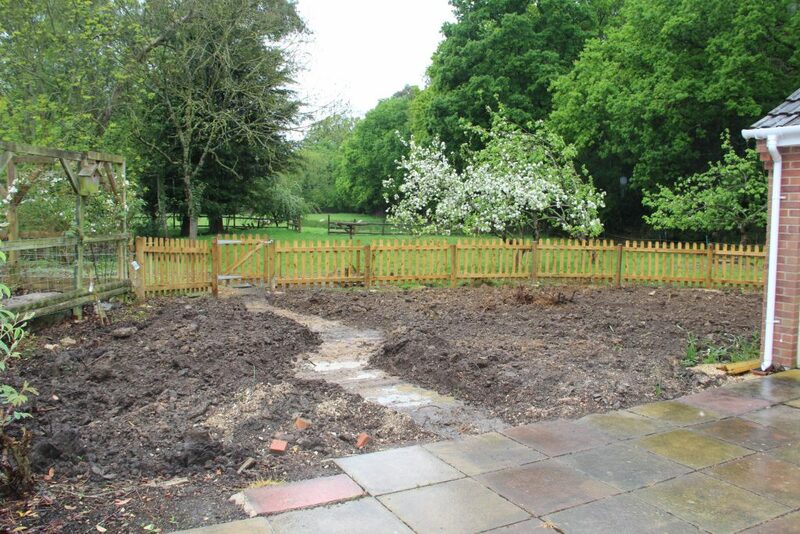 The brief was to redesign the whole garden to make it more streamline and lower maintenance. 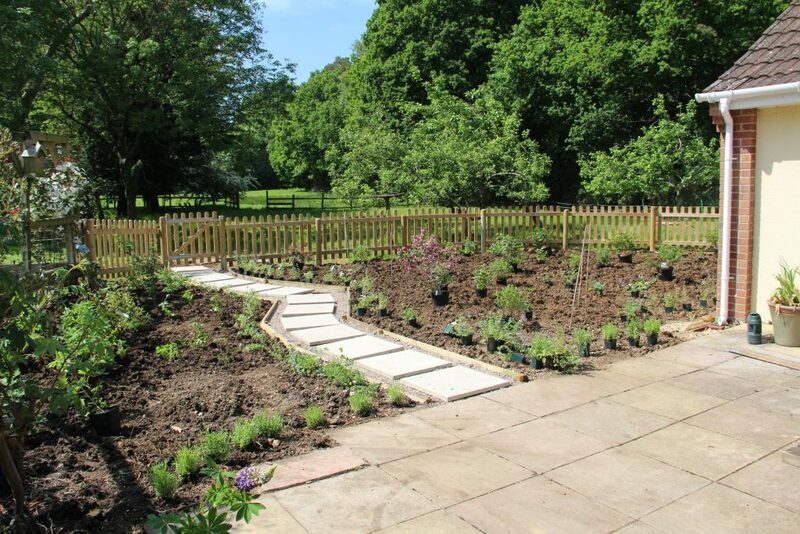 The central oval border in the front border was completely redesigned to create a summer flowering bee-friendly border planted with hardy geraniums, scabiosas, phlox, astrantias, asters and aquilegias, the existing narrow border by the path was removed, the whole area re-turfed and the gravel path edged with stone to define the border. 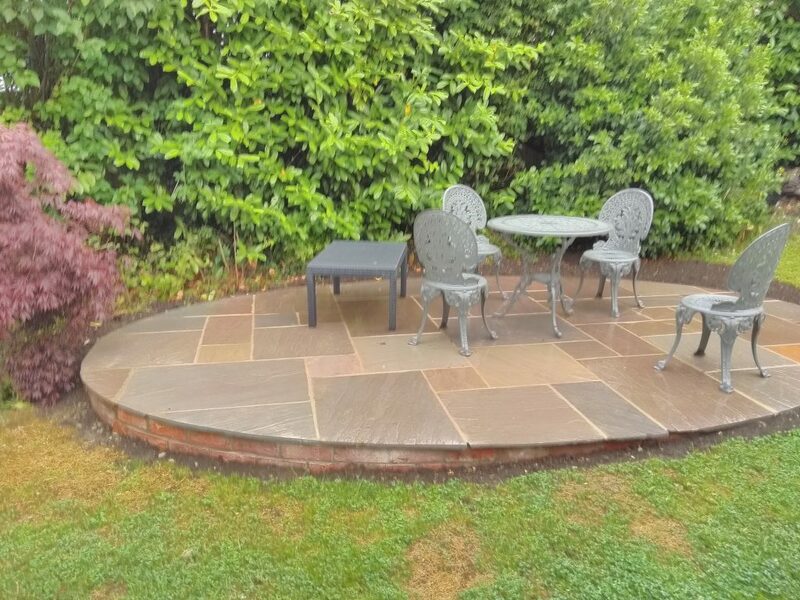 A small patio was designed for the back garden to catch the sun and the view and edged with a low lavender hedge. 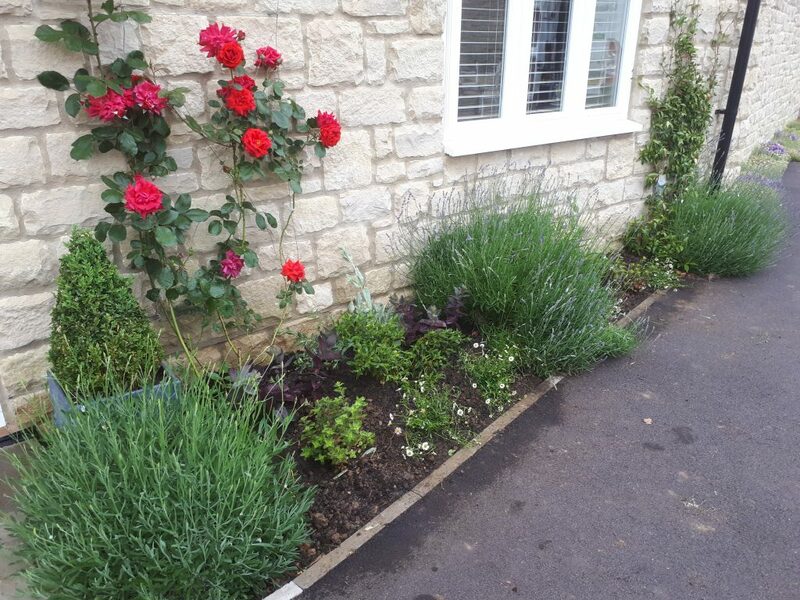 The narrow rose border was removed and the roses re-planted in the side border which was under planted with white cistus, nepeta and edged with hardy geraniums. 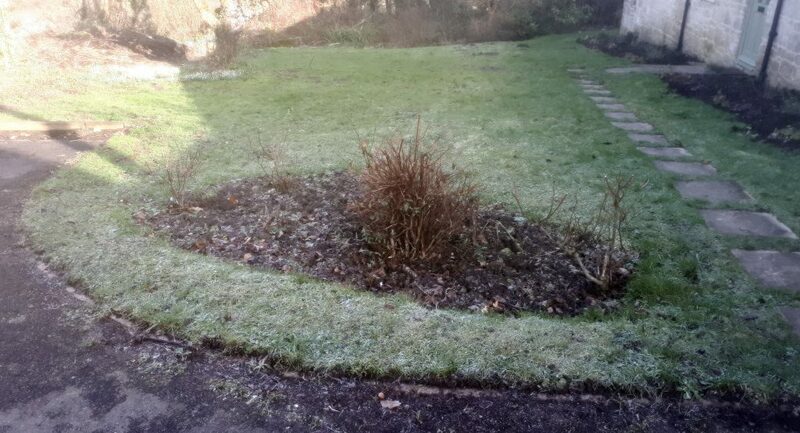 The rest of the garden was re-turfed. 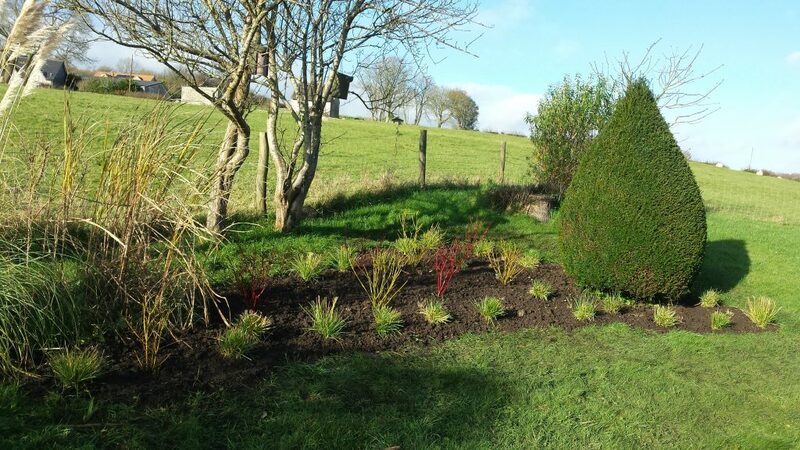 The client wanted to create a border using a hot colour palette of red, orange and yellow to provide interest from summer through to late autumn/early winter. The border was a curved shape going into the lawn so the planting was designed in a circle with a purple-leaved Cotinus (smoke bush) in the middle surrounded by red-barked Cornus Alba (dogwood) and sedum. 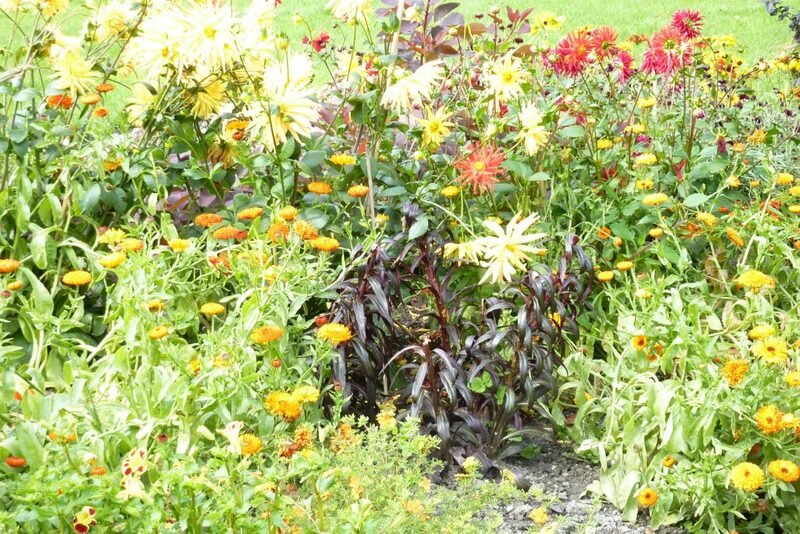 This in turn was surrounded by repeat planting of perennials such as yellow rudbeckias, orange heleniums, orange and red geums, white leucanthemums (shasta daisy) and orange, yellow and red dahlias. Alchemilla mollis was used to edge. 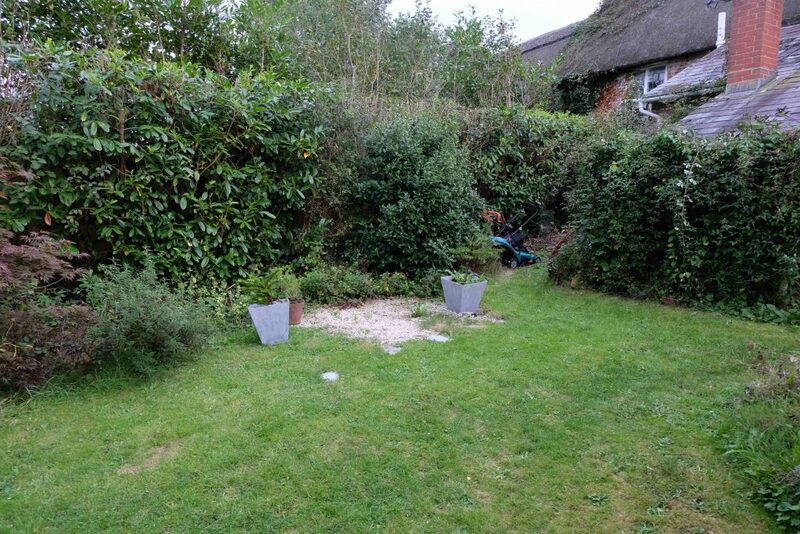 The garden was completely overgrown with fences falling down under the weight of rampant honeysuckle and clematis montana and ad hoc planting with no consideration given to providing interest throughout the year. 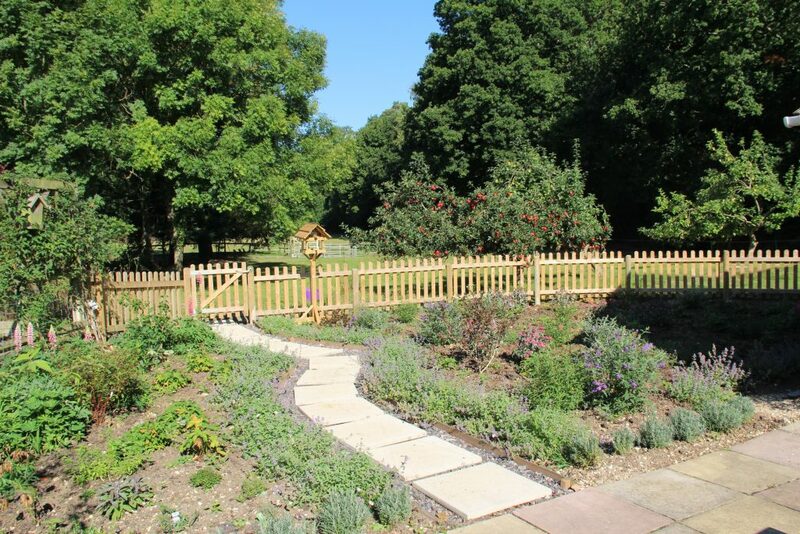 A wooden trellis across the end of the garden was built to provide privacy from the communal path across the ends of the gardens and planted with evergreen honeysuckle, clematis and fragrant rambling roses to provide a vista from the back of the cottage. 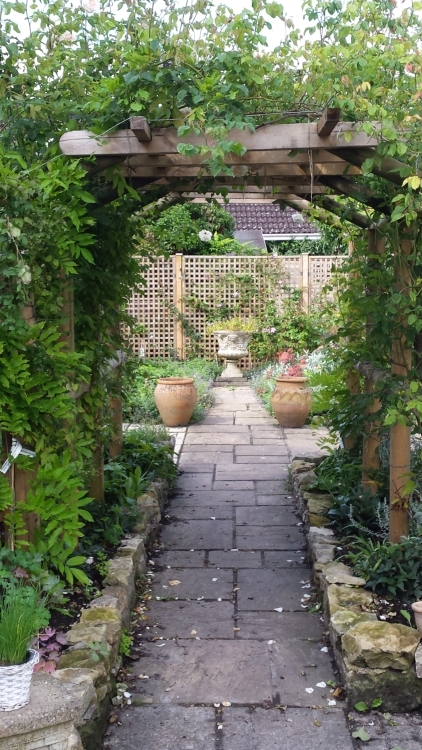 A new pergola was also commissioned to better show off the existing climbing roses and new wisteria and clematis were also added. 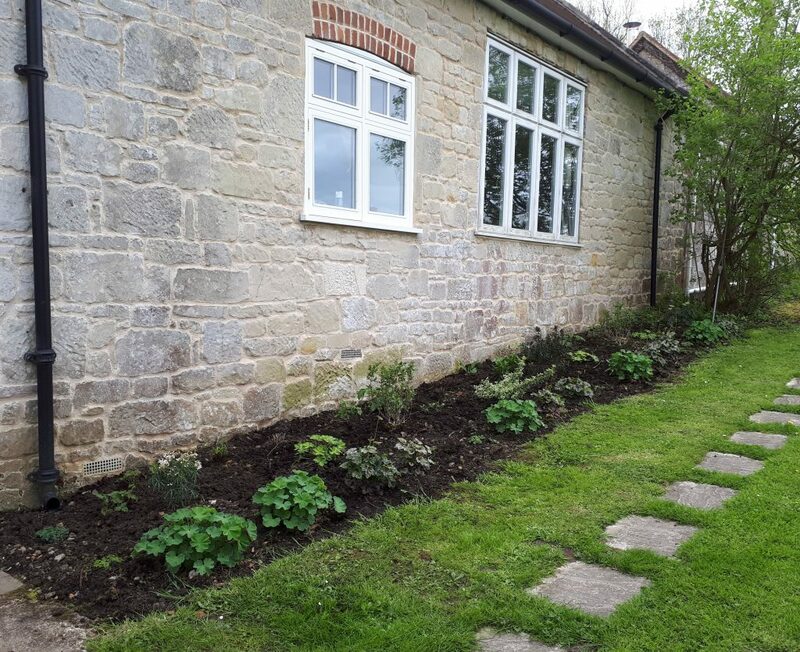 The planting is structured with evergreen shrubs and roses and complimented with bee loving cottage perennials such as nepeta, astrantias, scabiosas, salvias and hardy geraniums. Mass planting of pink and purple tulips and white and pale yellow narcissi add a splash of colour from March through to May.